Regolatore di tensione stabilizzato a 5,8V per riceventi. Il cavetto in dotazione consente di ridurre a 5.1V per elettroniche a basso voltaggio (4 celle). 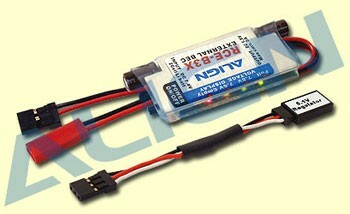 Using linear design, input power: 2 cell Li-ion or Li-poly battery, features no interference to receiver. Includes a 5.1V step-down voltage regulator, allowing use of Futaba servo models 9241.9251.9253.9254.9255.9256, and other digital servos not capable of handling 6V. Connect the regulator inline between the Gyro and the rudder servo. If you are using a servo that can accept 6V input, the regulator is not required. Features power switch and voltage indicating light for battery status, to remind users to avoid over discharge the receiver's battery and out of control caused by low voltage.